EDITOR'S NOTE: If more local school districts decide to cancel classes, this list will be updated. 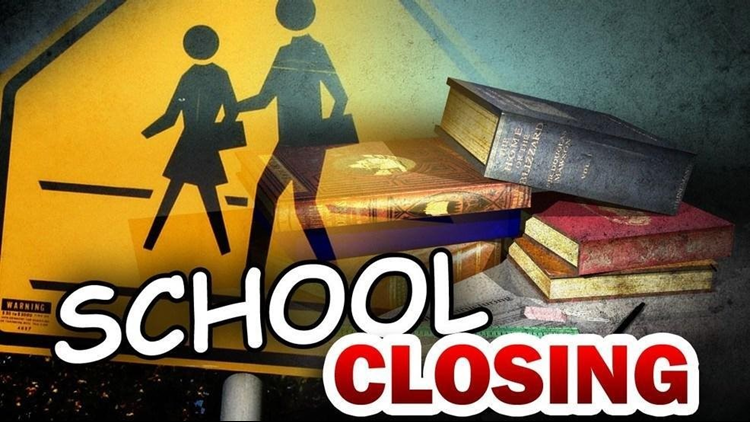 TYLER, Texas — Multiple East Texas school districts have canceled classes for Friday, February 8, due to an increase in absences stemming from illnesses. The current Walgreens Flu Index ranks the Tyler-Longview (Lufkin and Nacogdoches) area as No. 1 in the nation for flu activity. As of Thursday, Texas was third in the state rankings for flu activity behind only Mississippi and Nebraska. Eustace ISD - Classes will resume as normal on Monday, February 11. Even though school is canceled, the district says all athletic events will continue as scheduled. Gladewater ISD - Classes will resume as normal on Monday, February 11. District officials tell CBS19, students and faculty will make up the missed day on Thursday, March 7. Mt. Vernon ISD - Classes will resume as normal on Tuesday, February 12, as Monday, February 11, is a staff development day. All elementary and junior high events scheduled to take place after school are also canceled. The boy’s basketball games against Commerce, slated for Friday night, will carry on as planned, as well as a couple of other off-campus high school extra-curricular events. LaPoynor ISD - Classes will resume as normal on Monday, February 11. Oakwood ISD - Classes will resume as normal on Monday, February 11. All UIL sanctioned events will still take place tomorrow, including the academic meet in Wells and the basketball game against Laneville. Murchinson ISD - Classes will resume as normal on Monday, February 11. During the closure, the school will be deep cleaned and ready for students to return to class. Linden-Kildare CISD - Classes will resume as normal Monday, February 11. All extra-curricular activities will continue as planned. Jefferson ISD - Classes will resume as normal Monday, February 11. The closure will allow district officials to clean and sanitize the campuses. Karnack ISD - Classes will resume as normal Monday, February 11. The district says staff members will clean all areas of the schools and buses before students return to class. According to the Centers for Disease Control and Prevention, The single best way to prevent seasonal flu is to get vaccinated each year, but good health habits like covering your cough and washing your hands often can help stop the spread of germs and prevent respiratory illnesses like the flu. There also are flu antiviral drugs that can be used to treat and prevent flu. Avoid close contact - Avoid close contact with people who are sick. When you are sick, keep your distance from others to protect them from getting sick too. Stay home when you are sick - If possible, stay home from work, school, and errands when you are sick. This will help prevent spreading your illness to others. Cover your mouth and nose - Cover your mouth and nose with a tissue when coughing or sneezing. It may prevent those around you from getting sick. Flu and other serious respiratory illnesses, like respiratory syncytial virus (RSV), whooping cough, and severe acute respiratory syndrome (SARS), are spread by cough, sneezing, or unclean hands. Avoid touching your eyes, nose and mouth - Germs are often spread when a person touches something that is contaminated with germs and then touches his or her eyes, nose, or mouth. Practice other good health habits - Clean and disinfect frequently touched surfaces at home, work or school, especially when someone is ill. Get plenty of sleep, be physically active, manage your stress, drink plenty of fluids, and eat nutritious food. Wash your hands - Washing your hands often will help protect you from germs. If soap and water are not available, use an alcohol-based hand rub. Parents are encouraged to find out about plans their child’s school, child care program or college has if an outbreak of the flu or another illness occurs and whether flu vaccinations are offered on-site. Make sure your child’s school, child care program or college routinely cleans frequently touched objects and surfaces and that they have a good supply of tissues, soap, paper towels, alcohol-based hand rubs and disposable wipes on-site. In order to avoid an outbreak at work, find out about your employer’s plans if an outbreak of flu or another illness occurs and whether flu vaccinations are offered on-site. Routinely clean frequently touched objects and surfaces, including doorknobs, keyboards and phones, to help remove germs. Make sure your workplace has an adequate supply of tissues, soap, paper towels, alcohol-based hand rubs and disposable wipes.